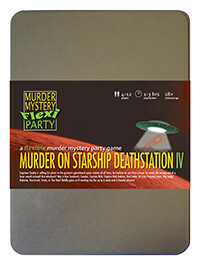 You've been invited to play the role of Han Sandwich in Murder on Starship Deathstation IV. The infamous Engineer Snotty has just finished the plans for the greatest operational space station of all time, and now he’s invited all sorts of scum and villainy from the across the galaxy to bid for them. But before the auction can begin, Snotty is found in pieces, literally, on the wrong end of a laser-sword! Can you boldly go and find his killer before they strike back again?! HAN SANDWICH is an intergalactic smuggler. His favoured weapon is a laser-blaster and he’s often found sporting a white granddad shirt with black waistcoat and black jeans. A red stripe down the side of the leg is optional, if you’d like to be decorated! becoming a smuggling confidence trickster was the quickest way to get what he wanted - money. Nowadays, Han flies from one side of the galaxy to the other in his pride and joy, the Centennial Eagle, smuggling bayloads of old spice from one planet to the next. My name’s Han Sandwich, you’ve probably heard of me, I’m the greatest smuggler in the galaxy. I’ve just docked my pride and joy, the Centennial Eagle, here for repairs. Trouble does have a habit of following me though, so I’m not surprised Engineer Snotty was killed off during my visit. I didn’t steal his plans, but that doesn’t mean I’m not still the greatest smuggler in the galaxy. You should see what I’m packing in my loading bays.